Fulfillment of desires or ending of Desires? Since Sai Baba fulfills our desires He is so popular and praised among the devotees. First step to become Sai Baba's devotee is getting a desire fulfilled, or praying to Sai Baba or doing a vratta in the name of Holy Sai Baba and get out of a difficult and distracting situation. Saibaba always used to say that , "I give people what they want so that I can give what I want to give them." What Saibaba wants to give is a spiritual urge and interest in spiritual matters tat will lead the devotees to the spiritual progress, untill they melt and merge into the divine one. 'Be one with Me' Sai Baba used to say. Being one with Sai Baba is melting and merging in the divine reality. Many would term that as spiritual attainment or divine attainment. That is the language of our ego or our wrong self, which is always after attaining something. It wants to attain power, it wants to attain security, it wants to attain peace. It even wants to attain divinity, which is impossible. How can a small self always getting disturbed with petty things, it can get disturb with a single statement from somebody attain the greatest, "Divinity".? But that is the wa our self works. Being petty it asks and thinks petty (little). One petty desire is fulfilled, it asks for another,and this continues until one realizes that, what is important is not the fulfillment of desires but ending of desire itself. When the petty self gets attacked by fear due to some insecurity, it goes to Sai Baba and most probably tells Sai Baba the solution of the problem. Baba if this thing happens, I will do this or that. And keep praying and remembering Sai Baba until that happens, get relived. The intensity of prayers and remembrance of Sai Baba or God or Divine reduces until another insecurity strikes and the petty self trembles from fear. While asking and suggesting the solution to SaiBaba it forgets, that the solution is coming out of the petty self, and so has to be petty and temporary. The love of te petty self, which has the habit of going down due to petty reasons rules over the Divine. The result? Would not it be better if we let the Divine will work on us and forget our self's will? Surrender to the Divine will, put more stress on Divine words fallen from Sai Baba's mouth like remembering God or Allah always. Reading holy scriptures and Sri Sai SatCharitra. Considering the Divine love over everything, everything our petty mind can produce as a solution to the so called Happy living. The real solution comes when the Divine Love and Divine energy fills the self or erase the self, removes the insecurity and wants. The self that was insecure, always looking for this and that, thinking it would satisfy the needs, is lost! and only Divinity persists. So rather than giving a solution to Sai Baba, why not say Baba i am troubled with a problem, i surrender the problem to you, i surrender the petty self to you and you fill it with Your Divine love, Your Divine protection, Your Divine devotion, and Your Divine Shakti (energy). Bolo SatChit Anand SadGuru Shri SaiNath Maharaj Ki Jai! Last Hanuman Jayanti April 19-20 my mom sat to recite 108 Hanman Chalisa in front of a Havan at my home. 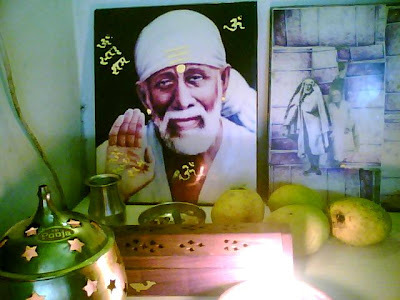 I was also pulled by the Havan and took Sai Baba picture and some dhoop of Loban and meditated on Sai Baba's picture along with the sacred energy from the scarf on the head and chanting of Sai Baba's mantras. Suddenly had an urge of writing took pen and a notebook and the above article happened. Today Thursday i copied and typed the same after praying to Baba to fill this article with His Divine Love and Grace. Sairam Alpesh wonderful post . .This is general approach one has ...in the end one forgets he is commanding(by prayer and rituals) the master who is the wirepuller of each and everything - Omnipotent . The article you have written today is simply superb. Just superb. I can understand Baba has inspired you to write. May Baba bless you and help you to write more such articles.
" My sarkar says "take, take" but everybody comes to me & says "give give" . Nobody attends carefully to the meaning of what i say. No one takes cognisance. My sarkar's treasury is overflowing. No one comes to fetch cart loads away. When I say "dig" no one dose so. No one wants to make efforts. I say dig up the wealth & plunder cart loads of it. The blessed son of true mother should fill his store with this wealth". May Baba always shower his choicest blessings & wisdom on u ..... may u always enlighten other souls wd each & evry post of urs. Thanks baba for all the love & care u bestow on me.I am mesmerised by ur miracles.You keep assisting me at each and every instance of my life.I can only thank you a million times, but baba why you are still punishing me.How long should i cry baba.? I am tired of the issues i am facing.Please bestow your blessings and help me to cross this rocky river. Who says he fulfills desires or wishes? come to me . ask me .I have been begging him for years to fulfill only one simple wish of mine,but till now he has not even given a glimpse of that happening.I will tell you how big the pain is.He always tests me gives me pain.Being sincere,honest,and obidient son of him has brought only pain.I do not know what is that he is looking from me.I pray he take my life.Atleast i will be happy he fullfils one wish of mine by taking my life. I always feel that you are with me. Please help me. I am in deep depression. I need your help very badly. why not even a sign of your blessings. What did I do wrong. So many worries are taking my peace away from me. All I need is your presence and blessing for me in each and every minute of my life. Before I run out of hope and believes in you please help me. Dear Baba, please help me and my brother, we are struggling with ravages of family disputes, financial hardship and peace of mind - nothing seems to be going right and it is very very heart wrenching when one seems totally at lose with all problems. Please please i beg you baba have mercy on my brother and I, bring peace and hope to us both, bring us the bright light of the universe which eludes us. Please let us have your presence in our lives and protect us from all negatives. Please baba show us the way and bring us both peace and show us way out of our many many problems. Bestow your miracle on us Sai Baba for you are the mother, father and family. Please come to us and stay and protect us from this very cruel world we live in. Go to my brother and bring him to the right path - heal him please. Thank you Baba. I surrender all my financial problems including huge debts to Thee. Baba, let Thy Will be done and not mine. I started Parayan of Sai SatCharitra yesterday (Friday). Baba please help my fiance in getting a good job.He is trying his utmost but i just dont know what is wrong with him.I cant see his problems...Please hepl us Sai Nath.Please hepl us!!!!!!!! sorry for asking u again an dagain but please fullfill my wish sendme to india i want to meet my sis and visit ur temple. 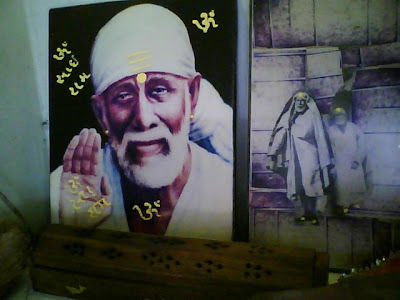 its the faith in you that keeps me going...just chant sai remember him he will connect patience thats what is required.Its like we dial his tel nun he wil answer he will send a sign. Hey Sai Nath...I just have this wish to fulfill as You have given me everything. You know how much I love him. Every time when i visited Shirdi or your temple to Lodhi Road asked for only one thing. Baba please use mana do please mere relation ko achcha kar do but every day it becoming worst and now its been 15 days I just have lost everything...I have lost him. Baba !!! no words can express his unconditional love towards all of us. Ihave always expereinced one thing when we live everything to baba , no doubt he would chose the best for us . So we need not scratch our head for anthing , wholeheartedly if we live it him . he will take care of us. He only expects true love from us . Please avaoid selfish prayers , just pray for becoming nearer to him . Then no doubt you will be blessed by him . babaji i have full faith in you. am parying wid full heart nad soul > i knw soon u will help me find a solution for the big problem my dad is going thru. pls be with me baba,take away all my pain and and the pain my parents is going through..
let me to live a life with the person whom i love. pls guide me and my parents.